They say that you can use social media productively with just 15 minutes a day. Perhaps during that time you find several industry articles that you want to share with your audience, but don’t want to bombard them with a continuous blast of tweets or posts. 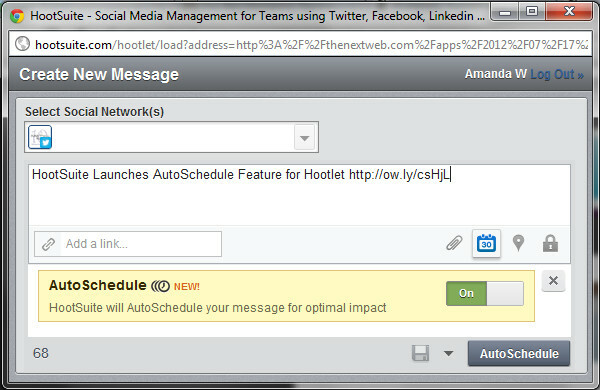 Hootsuite just announced its new “Optimal Auto Sharing” hootlet app, which takes all the guessing out of when to schedule posts. The app schedules your posts for specific times throughout the day or night without any input from you. The new app can be downloaded directly into your Google Chrome or Mozilla Firefox web browser. By simply clicking on the hootlet app in your browser toolbar, you can share posts at regular intervals seamlessly. Just click the calendar to schedule the post, make sure that the "AutoSchedule" option is selected, click the button to confirm and you're done! No one likes to be overwhelmed with numerous consecutive tweets or posts from the same person on social media. Even worse, other users can choose to ignore your articles or consider your posts to be spam. We think this tool is pretty neat so far because it doesn't require much more than a few clicks of the mouse and you know the article is being shared with your followers across many social media outlets. Thanks for sharing and the kind words Amanda! We're really excited about the Autoschedule release. Let us know if we can help with anything... more importantly, HOOT ON!